Business Architects need a series of tools for development, distribution, and management of the business architecture program. The tools every architect needs may range from comprehensive Business Architecture frameworks to common sense documentation and communications plan. With us, you have the advantage to gather knowledge on these from experienced professionals. With us, we provide Business Architecture consulting and train professionals so that business architects are not in ivory towers but are business driven. Business Architecture (BA) is rapidly gaining in popularity. At the Business Architecture Center of Excellence (BACOE), we make sure the architect is equipped, not merely with technical knowledge, but with knowledge of business processes and business information and solutions. We ensure the professional has the balanced set of business architecture skills so necessary in today’s business climate. With the rise in demand for qualified architects, most companies are looking at certification programs for ensuring the right personnel. Business Architects are professionals with an acceptable body of knowledge. This needs to be certified by peer reviews and a graded certification process. Our architect certification programs certify professionals based on their skills, knowledge and experience. Our certification programs will give you the Business Architecture skills that you need to distinguish yourself. BACOE certifications stand for a mark of excellence that is recognized globally. Our programs not only help individuals to grow professionally, but also helps organizations have objective standards by which they can evaluate candidates. 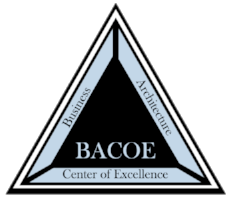 The BACOE recognize four grades of certification depending on what skills and experience a professional has. They are the certified BACOE Business Architect, Senior Business Architect, Distinguished Business Architect, and finally, the Business Architect Fellow. In addition to demonstration of actual Architecture artifacts development in our Workshop, the BACOE also takes into account the educational qualifications and written recommendations before deciding on a certification. Become a member of our organization and we will equip you with all the tools every architect needs.